Nautical precision instruments of the WEMPE SKIFF Series. Order online! Who buys a product of the WEMPE SKIFF Series is highly aware of precision and tradition. For 110 year the German company has produces marine instruments that are used on sailing yachts and research vessels. At sea it is crucial to recognize weather conditions early and to predict possible changes, for example with the WEMPE Series SKIFF. This comfort is also appreciated in the private environment, in which SKIFF products also have decorative appearance. This is owed to the housing that is available in two editions: lacquered and highly polished brass or chrome. With a diameter of 110mm and a 80mm clock face the SKIFF products are some of the smaller WEMPE instruments that are still easy to read. 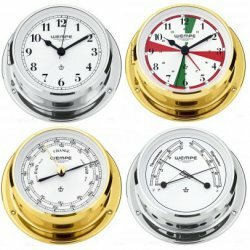 Convince yourself of the remarkable quality of the SKIFF Series that consists of yacht clocks, barometers, and comfortmeters.